This what millions of Americans say each year, just before they get injured in the kitchen. Unfortunately, accidents happen. And not just too clumsy people. It takes only a fraction of a second for something bad to happen, no matter how careful you are. And the risk of injury increases exponentially if you have kids running around. 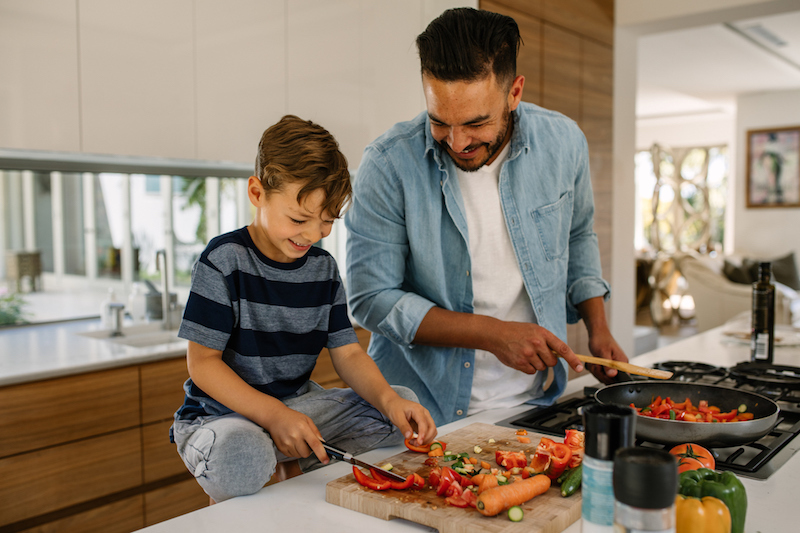 That’s why, in this article, I’m sharing with you 7 kitchen safety tips, so you can prevent yourself (and most importantly, your kids) from getting hurt in the kitchen. Your everyday cotton and polyester pot holders and oven mitts do provide certain protection. They are certainly better than grabbing hot pot with your bare hands. 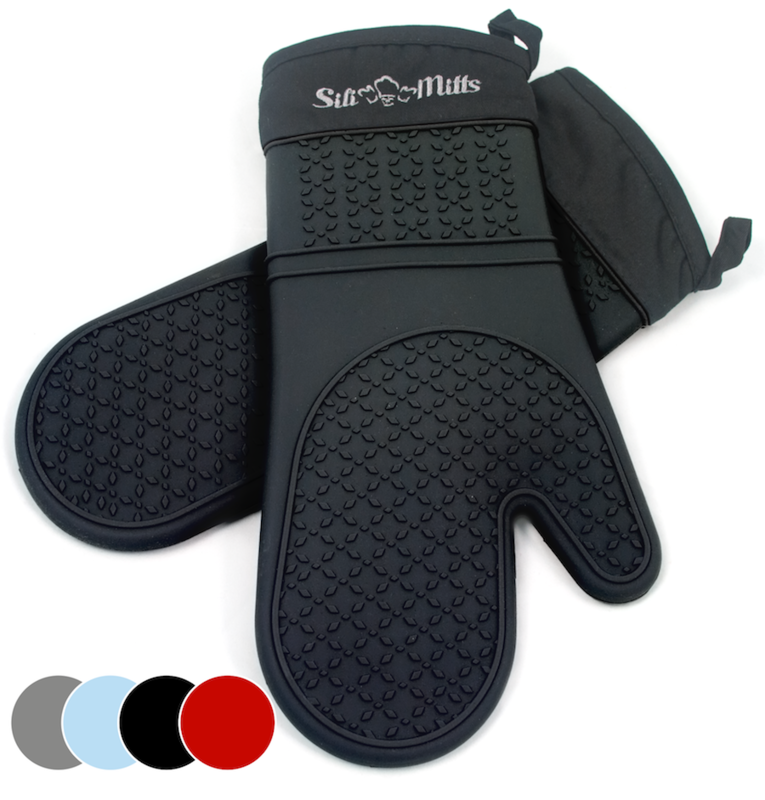 Silicone oven mitts and pot holders are the best choice for hand and forearm protection, they won’t wear down and develop holes or weak spots that can burn you when you least expect it. This kitchen safety tip is important, all it takes is one careless turn to pull the handle and burn yourself. But they won’t protect your hands from burns 100%. If you want true protection, replace them with silicon-based pot holders and oven mittens. I’ve been using these pot holders and oven mitts for a while now, and I’m very satisfied. Check them out on Amazon. If you spill anything near the extension cord (and you will at some point), you’re risking electrical shock injury. Instead, use a junction box. 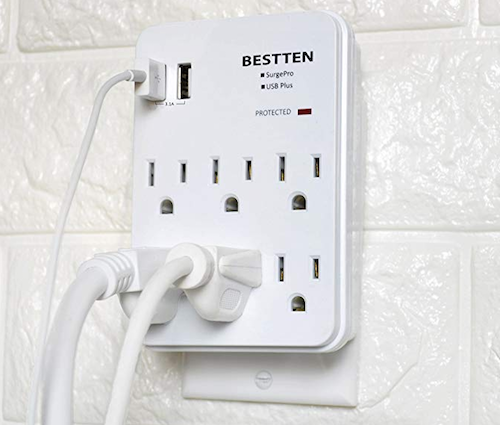 They’ll give you an extra plug in space, plus they have built-in GFI (ground fault interrupter) that will kick in if there’s a power shortage. Not the mention the what it can happen if your kid’s hand grab it. Always keep the pot handle turned to back. When we see fire, it’s our natural response to grab water and pour it over it. But, if you add water, flour or sugar on a grease fire, it’ll blow like dynamite! Instead, use baking soda or salt. 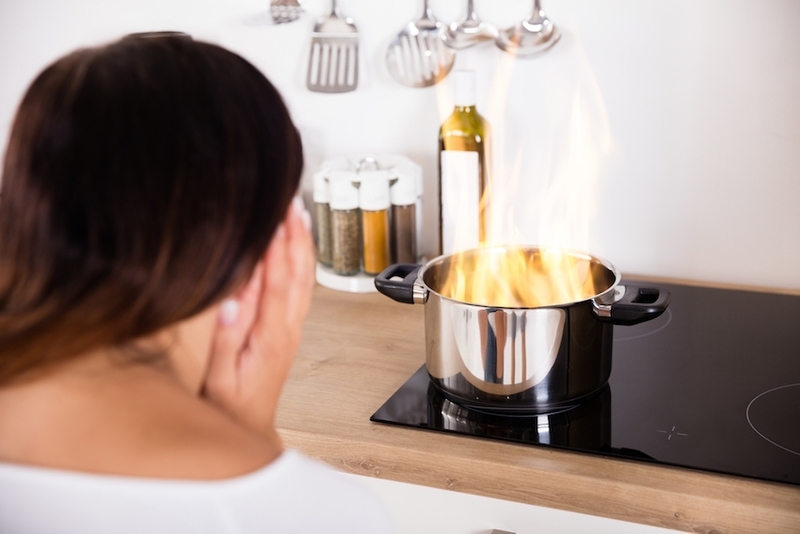 When you’re boiling water or your special sauce, it can easily happen for it to splash and cause you some serious burns. To avoid that, stir away from your body. It’s not a rare case that the cable on some of your appliances is damaged in some way. This can cause a lot of problems, anywhere from damaging the device itself to electroshock you, and even cause a fire. If you find out that the cable is damaged, plug it out and get someone to replace it. 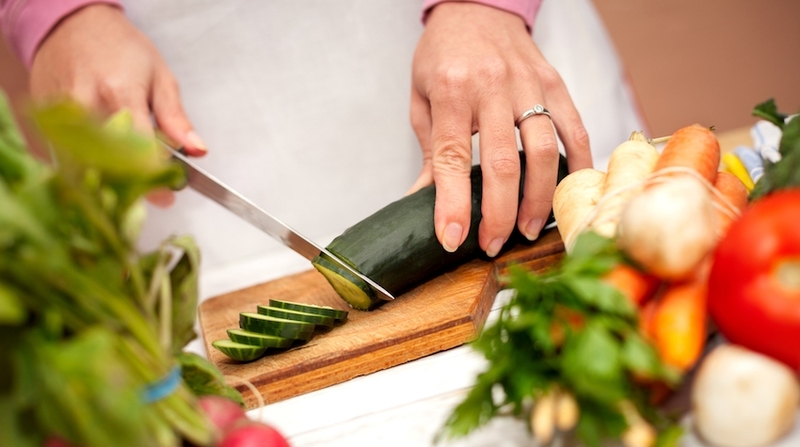 Millions of Americans each year visit ERs due to some sort of kitchen injury caused by a knife. You’re not Rambo. And knives aren’t toys, this kitchen safety tip is obvious but important. Handle them with caution and safely put them away when you’re not using them. It’s easy to get carried away, a Facebook notification. Phone call. Music. If you’re not focused on what you’re doing, you can easily hurt yourself badly. Never take your mind off of what you’re doing. Stay safe. Silicone outer is 100% FDA Approved Silicone, making it safe for you and your family. Lifted pattern allows for great grip. Inner Liner, inside 50% cotton, 50% polyester; outside black part 100% silicone. Heat Resistant oven mitts up to 482 F/ 250C. Silicone part is waterproof – no hot water burns or steam burns. Long oven mitts to cover your arms – no burns off the racks. Fits comfortably on male and female hands. Loops to hang or put in a drawer. Best Camping Lantern for Emergency, Backpacking, Hiking, Home and More! SAVE 15% ON AMAZON RIGHT NOW! When it comes to buying the best camping lantern, one would think that there’s not much to think about. If it gives light, it’s good, right? Well, not exactly. With hundreds of brands and thousands of models to choose from, buying the best camping lantern is not an easy task. They camping lanterns come in a variety of shapes, colors, price points, and with different sets of features. To help you make the best choice possible, I’m sharing with the list of things you should consider before you make your final decision. Being clear on how and where you plan to use the lantern will have great effect on your decision-making process. For example, if you plan to use it for fishing, the most important feature you should be looking for is if it’s waterproof. If you’re buying one to have it handy when there’s a power outage, then you should probably look for how long the battery will last. Very rarely one size fits all and all of the above will help you pick the best camping lantern. For some uses, you’ll need a camping lantern that is very bright. Other times, low brightness will do the job. If you look around, you’ll see lanterns ranging from 100 lumens to 1,100. 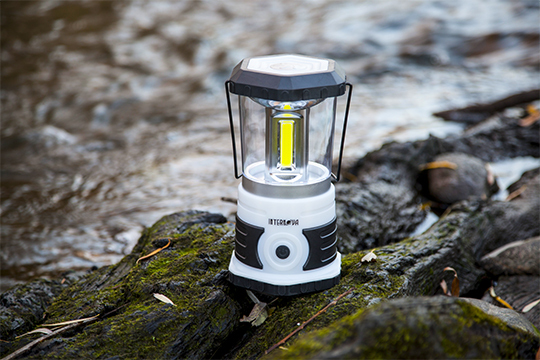 I recommend you go for the upper range of the spectrum for the best camping lantern. Most camping lanterns in that range have an option to choose lower brightness, so you can adjust it according to your needs. Click the “Save 50% on Amazon right now!” to see if this coupon is still available! Some camping lanterns come with a non-slip base, and you can place them safely on almost every surface. Others can hang on a tent or a tree. If you plan to use it in various places, then the best camping lantern should have both options. The Internova 800 Monster Lantern is a good example of this. The last thing you want to happen is for your camping lantern to break when you need it the most. To prevent that from happening, you need to make sure that the camping lantern is built from durable materials. As I already mentioned, there are many manufacturers of camping lanterns on the market, but not all of them have the best camping lanterns. Some make high-quality products. Some make cheap products and are open about it. But some make cheap products and try to push them as high-quality ones. To avoid being scammed, make sure that the manufacturer gives some kind of warranty and, ideally, a money-back guarantee on their camping lantern. This way you’re protecting yourself, because you can return the product if it’s not as advertised, or replace it doesn’t’ work as it should. In the end, why should you trust in their product if they themselves are not trusting its quality. Because of the variety of features and characteristics, the price can also vary. You can find some very simple ones for no more than $20, and they go up to $200 and beyond. But the best camping lantern isn’t always the most expensive. I don’t like those extremes. I always prefer the middle ground. Personally, I wouldn’t spend more than $40 on a lantern. I just don’t see the value that justifies the price above $40-$50. But again, everything will depend on your needs and your budget. Some of the things listed here might be obvious, some of them not. 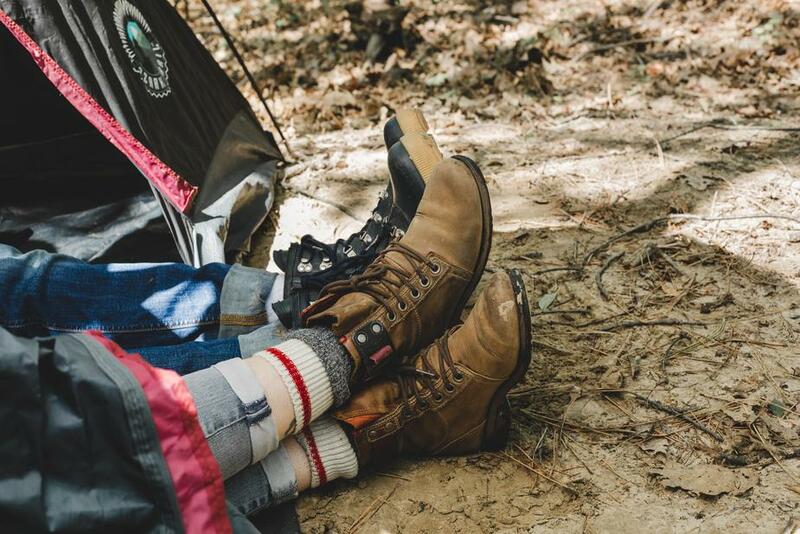 All in all, you know have a clearer picture of what to look for, what to avoid, and how to be safe when you’re buying your next (or your first) camping lantern. P.S. I get a lot of messages from people asking me what the best camping lantern is that I use and recommend. Personally, I use Internova’s 800 Monster LED Lantern. It fits all of my criteria and needs. And with the price point of just $34.97, it won’t break your bank. You can check it out on Amazon by clicking here or the “Save 50% on Amazon right now!” button below to see if the discount is still live! SAVE $10 ON AMAZON RIGHT NOW! For many years the best tactical flashlight was reserved only for law enforcement, military, and very, very dedicated preppers with deep pockets. Today, a good, high-quality tactical flashlight is an important tool, not just in every toolbox, but in every home and every car. And with the plethora of options to choose from, it’s important to know what to look for, in order to be sure that you got the best tactical flashlight … i.e. quality for your money, and not some cheap knockoff. In this article, I’ll share with you tips on the most important things you should look for and what to avoid. 1: What’s the tactical flashlight made of? There are many manufacturers of tactical flashlights. Some make good, quality ones. The others, cheap knockoffs made of plastics. You might be tempted to go with cheaper options because “a flashlight is a flashlight,” right? Well, not quite. They’re not the best tactical flashlight. You’re not buying an ordinary flashlight. You’re buying a reliable source of light in a situation where it’s essential to have an uninterrupted, intensive light – power outage, hunting, hiking, traveling at night, etc. The last thing you want is for your tactical flashlight to break if it falls, or to stop working with no reason. To avoid that, make sure that the tactical flashlight that you’re looking for is made of aircraft grade aluminum alloy. Do not try to find a plastic equivalent. It’s not worth it. A lumen is a unit in which we measure the brightness of the light. 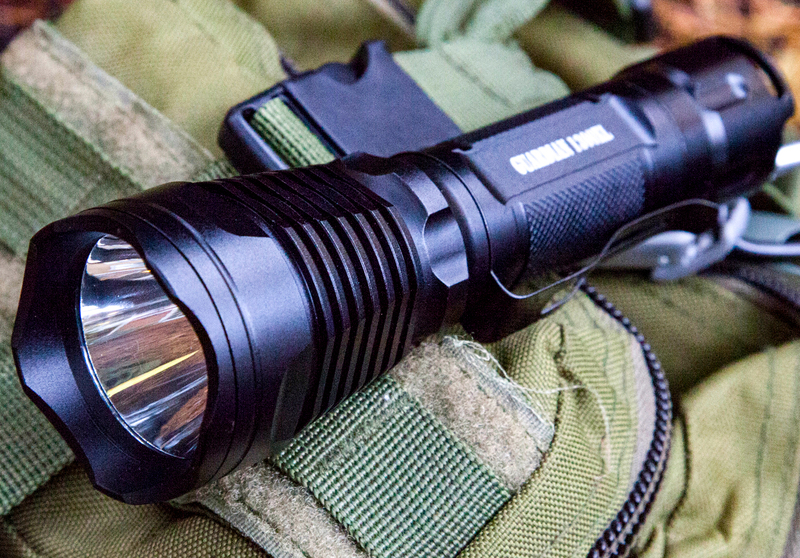 The more lumens your tactical flashlight has the brighter the light it emits. Some would say that 300 lumens of light is enough. 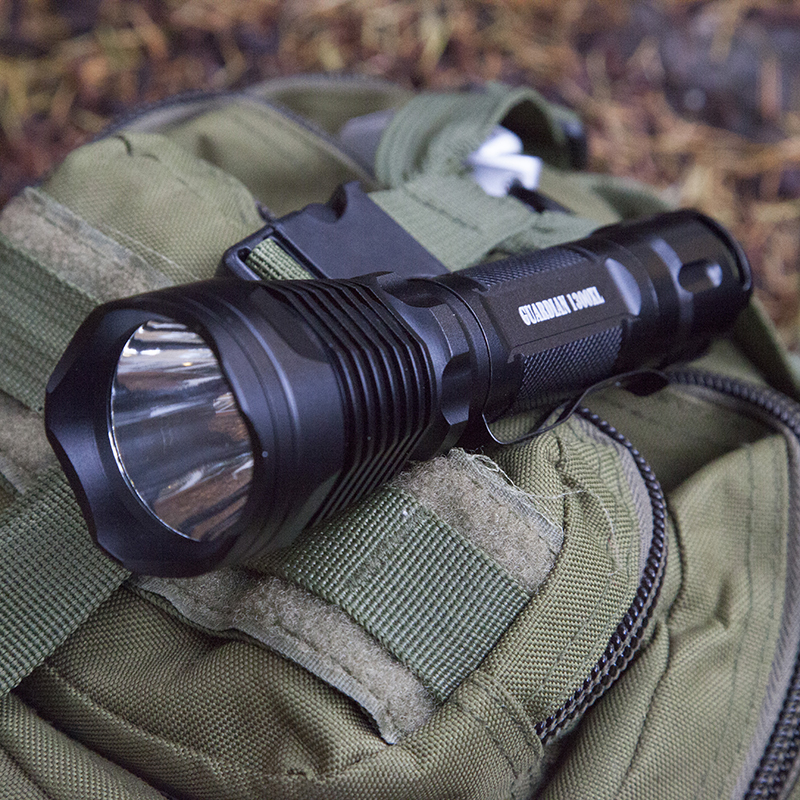 But considering the use of a it, I’d suggest you look for 1,000 lumens for the best tactical flashlight . That way you can be sure that you’ll have a tactical flashlight bright enough for every situation. The last thing you want to happen is to lose your source of light because your tactical flashlight fell into a puddle. Or because there’s too much rain. And you certainly don’t want it to stop working because it fell on the ground. Check the specs before buying and make sure the one you’re considering IS actually waterproof and shock resistant, which are essential to making it the best tactical flashlight. This is probably one of the most important features that makes for the best tactical flashlight option. Eventually, you’ll end up in an emergency situation, and you want to make sure that you’re going to be found. What SOS Mode does is this: it emits a regular, continuous, steadily signal so the help can find you. You don’t need to push the button until your thumb is numb. Just select the SOS Mode and leave the flashlight. Look for this feature. It can be a life-savior. As I already mentioned, there are many manufacturers of tactical flashlights on the market. But some make cheap products and try to push them as high-quality ones. To avoid being scammed, make sure that the manufacturer gives some kind of warranty and, ideally, a money-back guarantee. This way you’re protecting yourself, because you can return the product if it’s not as advertised, or in addition replace if it doesn’t work as it should. Some of the things listed here might be obvious, some of them not. All in all, you now have a clearer picture of what to look for, what to avoid, and how to be safe when you’re buying your the best tactical flashlight. P.S. I get a lot of messages from people asking me which tactical flashlight I use and recommend. Personally, I use Internova’s Guardian 1300XL. It fits all the criteria listed above. And with the price point of just $59.99, it won’t break your bank. You can check it out on Amazon here. High Quality Pot Holders and Oven Mitts – Our Top 3 Picks And Why! 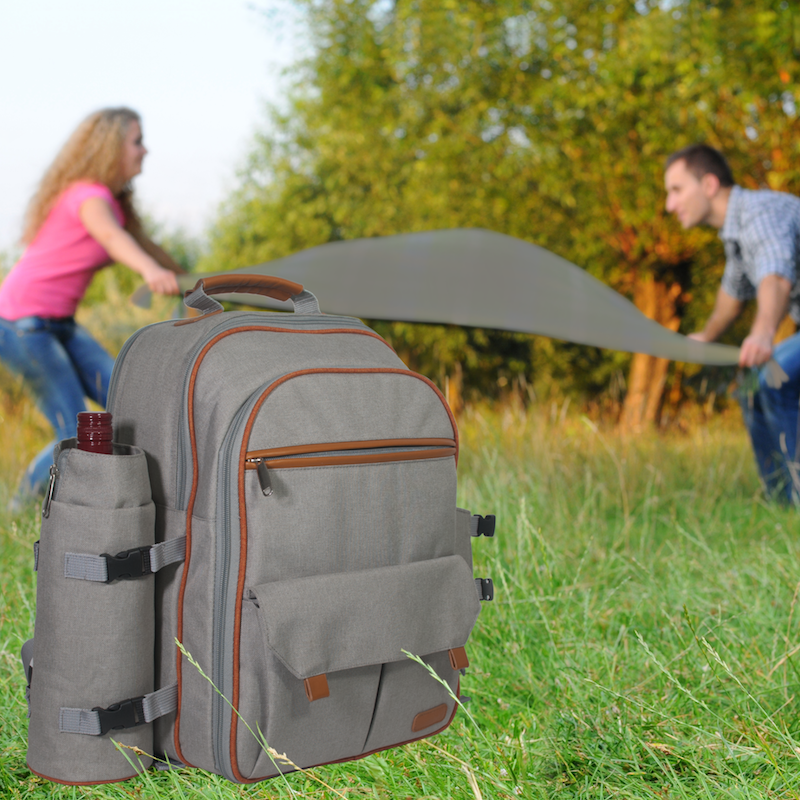 Best Picnic Backpack Set For 2 to 4 People and What To Look For!